Introduction: Occupational Health hazards of handling and management of electronic waste is a nascent subject. Improper and unscientific handling of e-waste can invite significant human and environmental health risks. Objective: To study the level of awareness about electronic waste and its health hazards amongst informal handlers in Musheerabad, Hyderabad. Methodology: Ethical approval and informed consents were obtained from Institutional Ethical Committee, University of Hyderabad and from the participants respectively before the commencement of study. This was a descriptive cross-sectional study conducted in randomly selected twenty-six waste handling centers from sixty of them in the locality. From each of the centers four handlers agedbetween 18 and 45 were randomly selected. Total of 104 handlers were interviewed using semi-structured schedule. Interviews were also conducted among 10 owners of such centres on the waste management practices. Results: About 72% of the handlers did not know the meaning of electronic waste and 71% were not aware of associated health risks, 85% did not use any protective gears, while 16% acknowledged health issues attributed to improper handling of e-waste, 77% felt their handling of e-waste was appropriate. Majority of center owners felt that informal e-waste handling does not pose any health risks, and reported that there was no awareness campaign by any agency as of then. Conclusion: This study highlights the need for awareness campaigns on proper e-waste management practices to ensure occupational safety among the waste handlers who belong to lower socio-economic strata. Electronic waste management is a problem in many countries. It is an important agenda for many international conventions such as Basel conventions, Rotterdam conventions, and Stockholm conventions. This problem is not just being faced by developed countries but also by developing countries like India. One of the ways the developed countries manage their e-waste is by dumping them in various developing nations. This necessitates one to study the process of e-waste management in developing/emerging economies like India and its impact on human and environmental health. Electronic waste or E-waste, is an important issue, and presently lacks a single definition. Around the globe, different organizations and regions define e-waste in their own way that includes, definition by European union (EU), Organization for Economic Cooperation and Development (OECD), Solving the E-waste Problem (StEP) initiative, Basel Convention. But the most commonly accepted definition for e-waste is the one defined in European Commission Directive of 2002. According to this directive e-waste is defined as electrical or electronic equipment, which is waste including all components, subassemblies and consumables, which are part of the product at the time of disposal. In India, meaning of e-waste is based on E-waste (Management & Handling) Rules, 2011. As per this rule, e-waste includes electrical and electronic equipment (EEE), either in whole or in part, which is discarded as waste by the consumer or bulk consumer and the ones which are rejected by the processes such as, manufacturing, refurbishment, and repair. There are differences in definitions of e-waste which affect the categorization. For instance, in EU, Waste Electrical and Electronic (WEEE) Directive has divided EEE into 10 categories. On the other hand, in India, E-waste (Management & Handling) Rules, 2011, has included only two categories. E-waste comprises EEE like laptops, computers, mobile phones, TVs, DVD players, mp3 players etc. which are discarded by their users as they become old or reach their end of life. It is one of the fastest growing waste streams in the world with an estimated global generation of 50 Million tons by 2018, with an average annual growth rate of 4–5%. Large household appliances represent the greater proportion (about 50%) of e-waste, followed by information and communication technology equipment (about 30%) and consumer electronics (about 10%). In India, government, public and private (industrial) sectors account for almost 71% of total e-waste generation followed by 16% contribution by individual households and rest by the manufactures. Trans-boundary movement is another important source. Down to Earth, in 2010, estimated that 50,000 tonnes of e-waste is getting illegally imported in India every year. As far as the nature of e-waste is concerned, it is composed of both hazardous and non-hazardous materials. Presence of toxic substances like lead, mercury, arsenic, cadmium, selenium, hexavalent chromium, brominated flame retardants etc. make e-waste hazardous in nature, although their percentage is much less as compared to precious metals content. Approximately 40% of the heavy metals found in landfills come from e-waste. Three Rs are the key principle for any type of waste management, i.e., Reduce, Reuse, and Recycle. Reduce principle is targeted at the design level. EU's Restriction of Hazardous Substances (RoHS) Directives restricts the use of hazardous substances to any electrical and electronic equipment (EEE). Reuse principle promotes reusing of EEE. While Recycling principle refers to e-waste recycling both at formal and informal sector. Formal e-waste recycling entails specially constructed facilities with proper equipment that allow for the safe extraction of the salvageable materials. These facilities, for most part, ensure safe working conditions. These facilities are expensive to build and operate. It costs about 25 crores INR to set up a formal recycling unit in a developing country such as India. Because of high installation cost and high cost along with stringent environmental regulation in developed countries, e-waste is transported to developing countries. A study commissioned by the US Environmental Protection Agency (EPA) revealed that it was 10 times cheaper to export e-waste to Asia than to process it in United States. On the other hand, e-waste recycling sector in developing countries is largely unregulated and the process of recovering valuable materials takes place in small workshops using simple recycling methods. They use rudimentary practices like open burning, acid bath, and so on for extracting metals thereby ignoring Occupational Safety and Health Standards (OSHA). Rudimentary methods may lead to the recovery of materials that are only worth a fraction of the total potential economic return. The informal e-waste recycling sector generally employs poor people, who have little or no formal education/training and are marginalized within their countries. The marginalized include social groups from ethnic or religious minorities, rural migrants, and immigrants. For instance in New Delhi alone, 25,000 people are earning their livelihood by engaging in collection, dismantling, and extraction of metals from e-waste. Women and children constitute a significant proportion of the workforce. Recent research in India, for instance, reveals that in recycling workshops there are about 450,000 child workers between 10 to14 years of age working at informal e-waste centres, with no adequate protection and safeguards. Informal e-waste recycling centres are often home based and family-run entities. Not only is informal e-waste recycling likely hazardous for human health and the environment, but it also leads to supply deficiencies in the formal sector. International treaty and National Regulations are in place to ensure Environmental sound management (ESM) of e-waste that designs and practices all practicable steps to ensure that hazardous waste or other wastes are managed in a manner that will protect human health and environment against the adverse effects, which may result from such waste. Basel Convention, 1992, a Multilateral Environmental Agreement (MEA), controls the trans-boundary movement of hazardous wastes and their disposal and is the most significant MEA in relation to tackling the issues surrounding e-waste and its management. Other MEAs like Rotterdam Convention, Stockholm Convention, Montreal Protocol also address e-waste problem. BAN Amendment or Basel BAN, adopted in 1995, entails banning shipment of hazardous wastes from OECD to non-OECD countries for the purpose of final disposal. India has ratified the Basel Convention but not the BAN Amendment, and officially opposes its enforcement. According to UNU Global E-waste Monitor, 2015, India occupied fifth position among the top 5 e-waste producing countries in 2014 by discarding 1.7 Million tons (Mt) of e-waste. India generated about 0.4 million tons of e-waste annually from computers, mobile phones, and television sets only with an expected growth rate of 10–15% per year. The Ministry of Environment and Forest, Government of India has brought e-waste (Management and Handling) rules 2011, into force on May 2012, but still more than 90% has been handled by the informal sector  that rampantly follow unscientific and unsafe methods for dealing with e-waste. As far as the state wise rank for the generation of e-waste is concerned, undivided Andhra Pradesh was at third position just after Maharashtra and Tamil Nadu. When it comes specifically to Hyderabad city, it secures a place among the top ten leading e-waste generating cities contributing around 6% of the total discarded e-waste in the country in the year 2012. Because of this stiff increase in production of e-waste on one hand and inadequate and ineffective rules and regulation for the scientific management of e-waste from government's side on the other hand, we can observe a boom in informal handling of e-waste in India. A considerably large section of population (mostly people belonging to low socio-economic status) are engaged in informal e-waste management sector as it offers them an easy option to earn their livelihood. The point of concern is the way they carry out dismantling process without using any protective gears (like goggles, gloves, mask etc. ), which exposes them to the toxic substances present within electrical and electronic items, thus making them vulnerable for severe health hazards due to prolonged exposure to toxic substances. The significance of the study lies in the fact that at the very outset it is necessary to have an idea regarding the workers' (informal handlers) prevailing awareness about e-waste and its health impact, which, in turn, will help in designing and executing the remedial measures effectively. Beside this, the study also tries to calculate the number of workers who are suffering/had suffered from health problems since their engagement in this occupation. The study was conducted in Musheerabad area of Hyderabad - the capital city of Telangana State. The reason for conducting study in Hyderabad lies in the fact that it secures a place among the top ten leading e-waste generating cities contributing around 6% of the total discarded e-waste in the country in the year 2010 and it is also a nurturing centre for informal handlers. Being one of the fastest growing IT hubs it is expected that the quantity of discarded e-waste in the city will rise in near future, which will ultimately result in a massive thrive in the informal recycling. The study involved the people of Musheerabad area, who are directly involved in the process of informal dismantling of e-waste and also the dealers/informal unit owners under whom they work. For sampling, twenty-six waste handling units were randomly selected from sixty of them in the locality. From each of the units, four handlers aged between 18 and 45 were randomly selected. Ten dealers were also selected from 26 waste handling units depending on their availability. This was a descriptive cross-sectional study. Data collection was carried out by using checklist and open-ended questions. Survey was done using checklist to suit the profile of the informal respondent groups with a sample size of 107 informal handlers in Musheerabad area while shopkeepers (under whom informal handlers are employed) had been interviewed in-order to apprehend the prevailing issue of rampant informal handling of e-waste in the city in a subtle manner. A checklist was developed and pilot testing was carried out before the actual commencement of the study. Checklist encompassed two parts; first part focused on the demographic characteristics like name (optional), age, duration of occupation, education, marital status, type of family, family history, number of children, whether child/children also work, and second part dealt with specific questions regarding awareness about e-waste, about the way they handle e-waste and the health hazards that they encounter while handling it. Personal interview was carried out with the shopkeepers (under whom workers were employed). Most of the shopkeepers were not the direct subjects of interest (some shopkeepers also do informal handling by themselves) but still they had been interviewed in order to gain insight about the magnitude and nature of working process of the informal handlers more explicitly. Data was analyzed using Microsoft Excel. Pie-charts and bar graphs were drawn in the full report. In this paper, data has been represented in tabular form. As discussed earlier, there are two levels of respondents, namely, the dealers and the handlers. Following paragraphs will be discussing the details of each of the respondent group and their role and awareness on e-waste management and their ill effects. 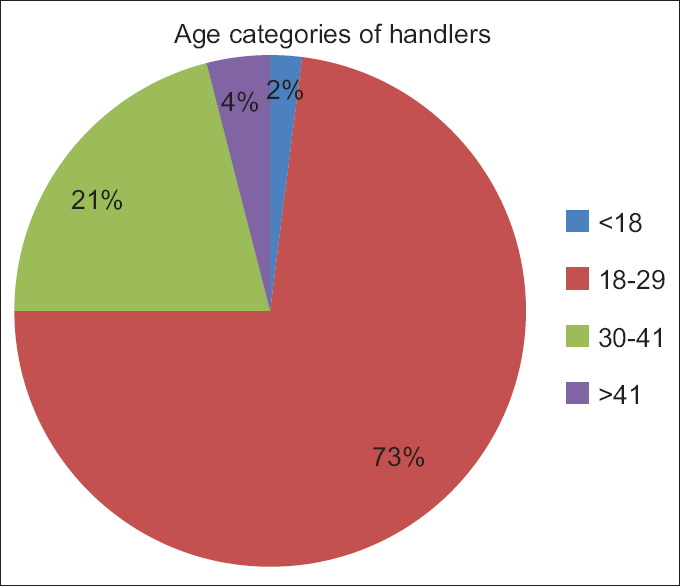 [Figure 1] shows about 3/4th of the handlers were from 18–29 years' age category. This may be due to large unemployment in the city. To validate this, we looked into educational qualification of handlers. [Table 1] shows that 47% of the respondents had more than 6 years of schooling, while 16% had more than 11 years of schooling including 9 handlers who were pursuing their graduation. One among them had finished post-graduation. Sixty-two percent had been working in this sector for 7 years or below, whereas rest of them were working for more than 8 years. Among the total respondents about 2/5th of them were married. It was also found that almost all of them (99%) belonged to local area. Only 1% of the respondents were found to migrated from other places. Fifty-seven percent of the respondents were from joint family, while rest of them from nuclear family. They were asked two questions on knowledge on e-waste. One was on knowledge about e-waste and other was on the harmful effects of e-waste. In total, only 1/4th of the respondents were knowing the meaning of e-waste and related health effects [Table 2]. On practice, we asked one question whether they use protective gears. In total, only 15% of the respondents were using protective gears while handling e-waste [Table 3]. We also asked questions related to illness reported after joining the unit. Seventeen percent of the workers reported to have fallen ill after joining e-waste management units. The types of illnesses are presented in [Table 4] and number of persons affected is shown in [Table 4]. We further also verified prescriptions for treatment of such illnesses to confirm them. This section discusses about the perceptions of dealers or owners of the informal E-waste management units. Open-ended questions were used for this purpose. Most of the dealers get e-waste larger private and government enterprises. Many of them strongly believed that informal way of handling is appropriate and does not pose any health risk. Blow injury was only recognized health issue. While two shop keepers reported the handlers suffered skin and breathing disorders. There was no awareness campaign on proper e-waste management, by any Government or NGO. Two of them insisted government intervention either by providing alternative job or by improving the working conditions of the workers. A dealer suggested a big container for disposing the leftover for every 5 to 6 shops. Hyderabad was on the seventh position among top ten e-waste generating cities in India in 2010. Hyderabad being one of the fastest growing IT hubs in the country, quantity of discarded e-waste will also rise in near future. To address this issue, Telangana Pollution Control Board (TPCB) has identified and authorized four e-waste recycling units to manage e-waste properly. In addition, TPCB has also given license to six e-waste collection centres, which are responsible for the purpose of collecting e-waste from the source and transport them to formal recycling centres. Even after such efforts, a major chunk of e-waste is being managed in informal sector. The present study was conducted in one of the informal setups in Hyderabad. For the present study, we have included twenty-one recycling units, which are all small-scale cottage industries with employee strength ranging between 2 to 8. These recycling units were located in an area resembles a slum in Hyderabad. Informal handlers were handling all types of e-waste such as cables/wires, computers, air-conditioners, refrigerators, mobile phones, washing machine, bulbs etc., None of the units were registered as formal organization. This makes them evade the law. As these industries were not registered, they do not come under any legal organization framework. There are many more units located in and around Hyderabad. This is in line with the report on informal recycling centres in developing countries. All e-waste handlers in the study area were males. This is in contrary to the existing literature highlighting more involvement of female workers. It was also found that in total, excepting 10 of them, rest all were Muslims. The religious affiliation may be another reason for minimal female workers' involvement in e-waste handling. Non-participation of women is a unique finding. One of the studies conducted in Ghana, Africa also mentioned that involvement of Muslim population were common in this sector. The same study also highlighted the engagement of younger age population in informal e-waste sector. This finding is supporting our findings where maximum numbers of workers (approx. 3/4th) were in the age group of 18–29 years, the age group which is highly productive. Their involvement in this sector indicate higher unemployment rate. In Telangana unemployment rate among 15–29 years age group was 7.7% as per Socio-economic Outlook, 2016. This further has an impact on persons' stay in the occupation for 7 seven years or more. Many studies ,, have highlighted that workers in informal sector are not well educated. This is in line with the findings of present study where it was found that about 3/4th of the participants had 10 years of schooling or below. But 16% of the participants were found either to be in the middle of their graduation studies or had already completed graduation and doing this job out of sheer compulsion at the absence of any more preferable alternative means for earning livelihood. It is also interesting to note that there are only 12% of the respondents who had no formal education. This gives an opportunity to impart education to them. If not, we may not be able to educate them about the ill effects of informal e-waste handling. Even though participants did not reveal anything about their monthly income we have collected information from other sources. The income of a handler varies from 80 to 100 USD/month. This is further supported by the study conducted by Zhang et al., 2012 in China according to which per capita income of a worker in informal e-waste sector in rural area earns approx. 1000 USD/year. Now, let us discuss about the knowledge of e-waste among handlers. It was found that only 23% of the workers know the meaning of e-waste. Only 28% of them were aware of the harmful effects of e-waste. Seventy-two percent of the workers did not even know that this occupation was not safe and might harm them. What is more worrisome is the fact that some of these educated workers (above 11 years of schooling) were well aware about the ill effects but they do not consider it as a serious problem. They found it to be too luxurious to expect that. It is indeed a dangerous situation and a matter of concern for a country like India, where majority of workers in this sector belong to highly productive age group. India does have a policy on e-waste management but, more than 95% of e-wastes are getting treated in unorganized settings located in urban slums. This is suggestive of poor enforcement of existing policies by the authorities. Only 16% of the workers had been found using protective gears (only goggles) while rest of the others were not using any protective gears. This is in agreement with the International Labour Organization report  which also highlights that informal handlers do not use any sort of protective gears thus violating Occupational safety and Health Standards. On asking whether they take any post exposure prophylaxis in case of any blow injury, they replied that they opt for TT (Tetanus Toxide) injection. Some of the workers even revealed that in specific cases they take TT injection every fortnight. No first aid kit was available in any of the recycling units. They reported that they usually approach a nurse, who lives in the vicinity, based on need. However, the cost of treatment is borne by the workers. Seventeen out of 107 workers were found to encounter health problems such as skin irritation, watering of eyes and breathing difficulties. As of today, no studies are published on this. There are no data about occupational morbidity till now, have given any data regarding occupational morbidity among informal e-waste handlers. A study conducted by Associated Chamber of Commerce and Trade (ASSOCHAM) in India in 2015 reported that 76% of the workers, at informal e-waste sector, were suffering from respiratory ailments. A case report by Jayapradha Annamalai in 2015 has reported about the occupational health hazards emanating from the process of informal recycling of e-waste in India emphasizing various methods of disposal of e-waste in India. Almost all the e-waste dealers were of the opinion that a huge portion of e-waste is discarded by Government and large private organizations. This finding is in agreement with the report (Assocham.org, 2016), which also highlighted that in India, government, public and private (industrial) sectors account for almost 71% of total e-waste generation. This is a serious concern as even the government organizations handover the discarded e-waste to informal sectors and contributing and indirectly supporting largely in the growth of informal and unsafe e-waste recycling practices. Most of the dealers were under the impression that informal way of handling of e-waste does not pose any health problems to the handlers. This is similar to the mention on this in a report by Lundgren et al., 2012. As per dealers the only health issue which is commonly faced by the workers is the accidental blow of hammer/hammer likes instruments/sharp wires and for that they are cautious enough to take the victim to nearby clinic for TT (Tetanus toxide) injection. Though such act of cautiousness deserve appreciation, the concerning fact is that the victims opt for TT injection frequently (once in two months or in some cases even in 15 days also). But two of the dealers expressed contrary viewpoint by revealing that many workers do suffer from health problems due to this informal handling of e-waste but they are reluctant to reveal this out of the fear that such revelation may ultimately result in the loss of their livelihood. E-waste management, an important subject that has been discussed in various forums in details. Even after number of treaties, conventions, and regulations on the subject at national and international levels, global north is still dumping its waste in south. India being a signatory to those treaties has become a recipient of e-waste in return. India is 5th largest e-waste generator, it also receives about 50,000 tons of them every year from developed countries. In order to address the issue, an E-waste management policy (2011) was launched. This had created number of formal treatment facilities. But, that did not solve the problem. Even today, more than 90% of e-waste is treated in informal sectors. The agony did not end there. The workers jeopardize their health by exposing themselves directly to e-waste by not using protective gears. The only positive thing that happens because of this is, generation of employment opportunities along with some damages to human health and environment. Hyderabad is an emerging as a destination for various industries without a workable strategy for proper e-waste management. This study explored level of awareness among workers on impact of exposure on their health and practices. The unemployment level in urban centers and lax implementation of policy may be the reason for these. This makes it clear that it is not sufficient to concentrate only on formal e-waste management practices but also to focus on informal sectors both at national and international levels. Lundgren MK. The global impact of e-waste: Addressing the challenge [Internet]. 2012. Available from: http://www.ilo.org/sector/Resources/publications/WCMS_196105/lang--en/index.htm. [Last accessed on 2017 May 3]. E-waste Management and Handling Rules, 2011. Balde CP, Kuehr R, Blumenthal K, Fondeur Gill S, Kern M, Micheli P, et al. E-waste statistics-Guidelines on classification, reporting and indicators”, United Nations University, IAS-SCYCLE, Bonn (Germany) 2015, 51 pages (ISBN Print: 978-92-808-4553-2) (with CP Balde, K. Blumenthal, S. Fondeur Gill, M. Kern, P. Micheli, E. 2015. Available from: http://collections.unu.edu/view/UNU: 5620. [Last accessed on 2017 Jun 17]. Pinto VN. E-waste hazard: The impending challenge. Indian J Occup Environ Med 2008;12:65. Balde CP, United Nations University. The global e-waste monitor, 2014: Quantities, flows and resources; 2015. Assocham.org. (2016). ASSOCHAM India: The Knowledge Chamber. [online] Available at: http://www.assocham.org/search/search.php?query=e-waste+workers+suffer+from+respiratory+ailments&search=1 [Accessed 12 Feb. 2018]. Tricks of the e-waste trade [Internet]. Available from: http://www.downtoearth.org.in/coverage/tricks-of- the-ewaste- trade-- 325. [Last accessed on 2017 Jun 17]. Perkins DN, Brune Drisse MN, Nxele T, Sly PD. E-Waste: A Global Hazard. Ann Glob Health 2014;80:286-95. Sabha R. E-waste in India, research unit (Larrdis), Rajya Sabha secretariat, New Delhi. International Labour Office, Cooperative Branch. Tackling informality in e-waste management: The potential of cooperative enterprises. Geneva: ILO; 2014. Baldé CP, Wang F, Kuehr R, Huisman J. The global e-waste monitor. UNU-IAS: Bonn, Germany; 2014. Raghupathy L, Krüger C, Chaturvedi A, Arora R, Henzler MP. E-waste recycling in India: Bridging the gap between the informal and formal sector. 2010. Available: http://www.iswa.org/fileadmin/galleries/General%20Assembly%20and%20WC%202010%2011%20Hamburg/Presentations/Krueger.pdf. [Last accessed on 2018 Jan 09]. Akormedi M, Asampong E, Fobil JN. Working conditions and environmental exposures among electronic waste workers in Ghana. Int J Occup Environ Health 2013;19:278-86. Government of Telangana. Socioeconomic Outlook 2016 [Internet]. Telangana; 2016. Available from: http://www.telangana.gov.in/PDFDocuments/Socio-Economic-Outlook-2016.pdf. [Last accessed on 2017 Jun 19]. Herat S, Agamuthu P. E-waste: A problem or an opportunity? Review of issues, challenges and solutions in Asian countries. Waste Manage Res 2012;30:1113-29. Wani I. Photo Story: How E-Waste Workers in Delhi Jeopardise Their Health to Earn a Living [Internet]. The Wire. 2017. Available from: https://thewire.in/132025/photo-story-the-e-waste-workers-of-delhi/. [Last accessed on 2017 May 20]. Annamalai J. Occupational health hazards related to informal recycling of E-waste in India: An overview. Indian J Occup Environ Med 2015;19:61.